John C. Glennon, D.Engr., P.E. 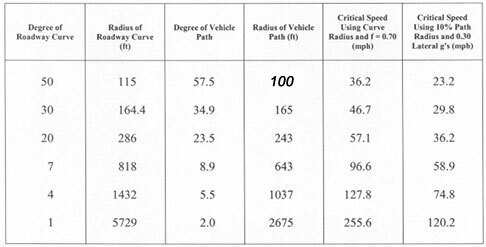 To calculate how fast a vehicle was traveling when it lost control rounding a horizontal roadway curve, given the radius, cross slope, and tire-pavement friction. To calculate the loss-of-control speed for a yawing vehicle based on the measured radius of the yaw marks, the pavement cross slope, and the tire-pavement friction. As commonly applied, both of these methods tend to give inflated speeds. The following discussion first provides a basic primer on the dynamics of a vehicle rounding a circular radius and then points out the common errors associated with each of the two applications. 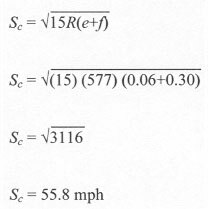 Converting Equation 5 to allow for the velocity, S, in mph, and accounting for the roadway curve superelevation, e, yields the familiar form of the centripedal acceleration equation. Critical speed used in this context is a term for the speed at which a vehicle will lose lateral control on a given roadway curve. The normally flawed procedure is to assume the highway curve radius as the critical path taken by the vehicle. On the surface, this procedure appears reasonable since the driver is apparently attempting to drive around the roadway curve. This theory fails, however, when it's used to compute the speed at loss of control on a dry surface with a reasonably good tire-pavement friction value of, say 0.70. 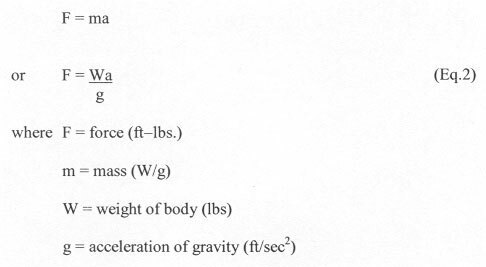 The procedure assumes that the driver exactly followed the roadway curve radius with a steady-state (not braking or speeding up) lateral acceleration (commonly called centrifugal force) of 0.7 g's. Studies consistently show, however, both that drivers' normally steer instantaneous path radii that are sharper than the roadway curve and also that drivers cannot tolerate steady-state lateral accelerations greater than about 0.30 g's. Therefore, a more likely scenario is that the driver, because of inattention or surprise, proceeded into the roadway curve without any initial steering and then needed to turn a sharper path than the roadway curve to stay on the roadway, thereby generating a temporal lateral acceleration greater than 0.7 g's at a speed much lower than the speed calculated by assuming the roadway curve radius is the vehicle path radius. Another likely scenario is where the driver entered the roadway curve too fast, generating .30–0.35 g's of lateral acceleration. Because the driver could not tolerate this level of lateral acceleration, he tried to compensate by flattening his path and/or braking, either of which could induce loss of control. As the reader can see, the theoretical critical speed calculation is far greater than the more realistic empirical calculation. In summary, given that all drivers drive a path radius sharper than the roadway curve and given than most drivers cannot tolerate lateral accelerations much greater the 0.3 g's, a more realistic critical speed calculation should take these expected characteristics into account to arrive at an expected loss of control speed. Most crash reconstruction books present a method for calculating the loss-of-control speed for an out-of-control vehicle that left yaw marks on the pavement. Yaw marks are tire marks characterized by diagonal striations left by a rotating tire sliding partially sideway on the roadway. Let's be entirely clear that this reconstruction method is presented in several well-used accident reconstruction texts. However, just because the method first showed up in one prominent text and subsequently has been copied by several "me to" texts doesn't make it right. This "critical speed" method must withstand the rigors of scientific inquiry, which it does not. In reality, this equation explains the dynamics of a steady-state point mass object and, therefore, should not be applied using tiremarks that are associated with a rotating out-of-control vehicle. The only time yawmark radius can ever be reasonably used to calculate vehicle speed is when a vehicle is steered right at critical slip and deposits yawmarks with the vehicle (marginally) under control. Conduct a chord-offset measurement of the yawmark(s). Calculate the radius of the yawmark(s) from the chord-offset measurements. Add or subtract half the wheel track to obtain the path radius for the vehicle's center of mass. Measure or estimate tire-pavement friction. Measure the roadway cross-slope relative to the yaw mark. 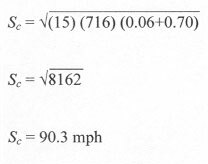 Calculate the loss-of-control speed using the centripetal acceleration equation. The actual path of an out-of-control yawing vehicle can be mathematically described as a spiral. A spiral is a locus of points forming a curved path with continuously decreasing radius. The loss of control point, of course, is usually at or just before the beginning of the tire marks. Starting with the beginning of the yawmark, if a relatively short chord is used, the calculated radius will be relatively high and the calculated speed will be relatively high. If a relatively long chord is used, the calculated radius will be lower and the calculated speed will be lower. Also, as the chord measurement is made starting further along the yaw mark, the calculated radius will be lower and the calculated speed will be lower. Because the chord-offset method is intended to measure a circular curve, which for this application is applied to a spiral curve, because the measurement must be made downstream from the loss-of-control point where the vehicle is now rotating around its center of mass, and because the radius calculated by the chord-offset method is very sensitive to small measurement errors, this method can produce substantial error in estimating loss-of-control speed. The alternative to calculating speed from the centripedal acceleration equation by measuring the radius of yawmark is, of course, to treat the crash as any other single-vehicle crash where the reconstruction considers the dissipation of energy through skidding, rollover, collision with fixed objects, etc. 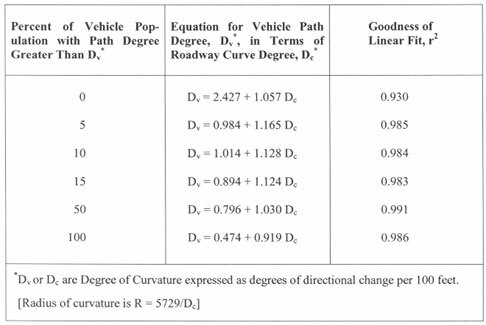 Glennon, John C., and Weaver, Graeme D., The Relationship of Vehicle Paths to Highway Curve Design, Texas Transportation Institute, Research Report No. 134-5, 1971. Glennon, John C., Neuman, Timothy R., and McHenry, Brian G., Prediction of the Sensitivity of Vehicle Dynamics to Highway Curve Geometrics Using Computer Simulation, Transportation Research Record 923, 1983. Glennon, J. C., Neuman, T. R., and Leisch, J. E., Safety and Operational Considerations for Design of Rural Highway Curves, Federal Highway Administration, 1983. Neuman, Timothy R., Glennon, John C., and Saag, James B., Accident Analysis for Highway Curves, Transportation Research Record 923, 1983. Glennon, John C., Effect of Alinement on Highway Safety: A Synthesis of Prior Research, Transportation Research Board, State of the Art Report 6, 1987. Glennon, John C., and Weaver, Graeme D., Highway Curve Design for Safe Vehicle Operations, Highway Research Record 371, 1972. Glennon, John C., State of the Art Related to Safety Criteria for Highway Curve Design, Texas Transportation Institute, Research Report No. 134-4, 1969. Onofrio, John A., and Howarth, Louis E., Forensic Engineering Review of Critical Speed Formula, NAFE Journal, December 2005. Manning, Lindley, Critical Speed in a Curve – Update, NAFE Journal, june 1990. Manning, Lindley, Highway Speed vs. Sideslip (Critical Speed in a Curve), NAFE Journal, October 1984.